SCVHistory.com LW3084 | St. Francis Dam | William Mulholland Inspects Dam Disaster Site, 3-14-1928. 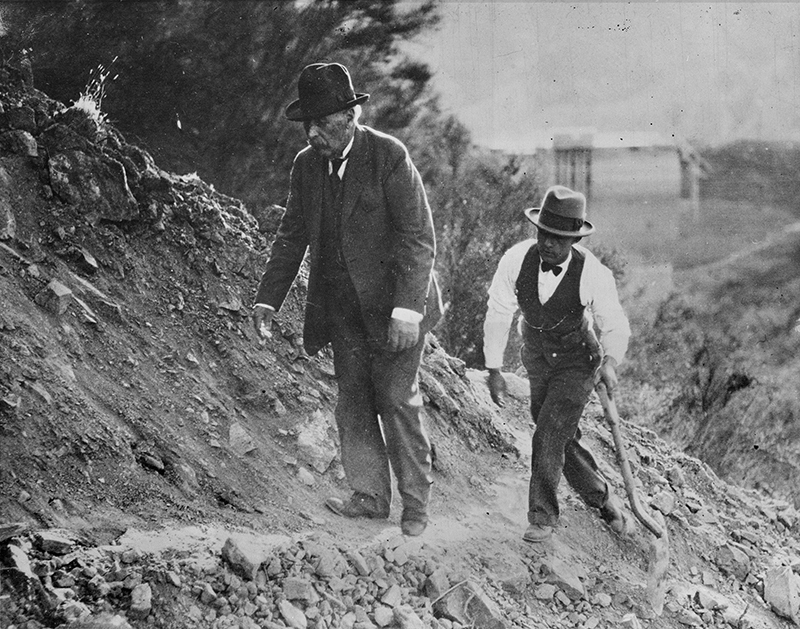 March 14, 1928 — Chief Engineer William Mulholland (left) tries to make sense of it all, one day and two nights after the St. Francis Dam failed, killing nearly 450 people. According to the file card, the man carrying the shovel is Mulholland's assistant, Harvey A. Van Norman. But St. Francis Dam historian Don Ray says it is George Vejar, Mulholland's chauffeur. Vejar "confirmed to me that it was him in this George Watson photo," Ray said (pers. comm. 2017). "Vejar told me that Mulholland often carried a shovel to use more as a cane." The original 4x5 negative, shot with a 4x5 Graflex camera, was donated to the J. Paul Getty Museum. This is the 4x5 copy negative from the Watson Archive. The image also appeared in the book about the Watson family of photographers, "Quick, Watson, the Camera: Seventy-Five Years of News Photography, Los Angeles" (Delmar Watson ed., 1975). LW3084: 9600 dpi jpeg from 4x5 copy negative purchased 2017 by Leon Worden from the Watson Archive.